Foltynewicz (elbow) will resume throwing Tuesday, Mark Bowman of MLB.com reports. Elbow soreness has slowed Foltynewicz's start to camp, but he appears to be trending in the right direction. The injury is considered a minor one, as the righty reportedly would have pitched through the issue in the regular season. 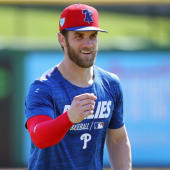 He'll have to build up his arm strength, throw some bullpen sessions and throw at least one live batting practice session before making a Grapefruit League appearance.